Colleges:  Krishna Institute of Medical Sciences Information is provided for the first year entrance exam for undergraduate program for MBBS & BDS. It is an all-India examination and will be held at eleven centers across the country. The Krishna Institute of Medical Sciences MBBS & BDS Entrance Exam will be held at Karag, Pune, Mumbai, Nagpur, Delhi, Chandigarh, Indore, Surat, Ahemdabad, Hyderabad, Cochin. Exam centers are chosen by candidates at the time of filling out applications. Candidates must bear all costs such as transportation, etc., to appear for the examination. The table below gives a summary of the course information for the KAIET BDS & MBBS Admissions to be held in May 2018. Candidates need to appear for a pre medical test, KAIET 2018 to qualify. Candidate seeking admission to KAIET should be an Indian citizen. She/he must have attained 17 years of age at the time of admission or should complete 17 years of age on or before 31st December 2018. The Secondary School Certificate or equivalent examination Certificate of age and nationality endorsing the date of birth will constitute the valid proof. The Higher Secondary Certificate/Indian School Certificate Examination/Central Board of Education Examination or an equivalent examination thereto comprising Physics, Chemistry, Biology and English. Candidates belonging to the open category must secure not less than 50% marks in Physics, Chemistry and Biology taken together at the KAIET 2018 examination. Candidates belonging to backward classes must secure not less than 40% marks in Physics, Chemistry and Biology taken together at the KAIET 2018 examination. A person belonging to Non Resident Indian (NRI), Person of Indian Origin (PIO) and Foreign National (FN) are not required to appear for the KAIET 2018. Candidates who have studied and passed the qualifying examination from schools and colleges located in countries other than India. They have to submit a separate application, in a specifically prescribed form, available in the office of University and on the University website. A commitment for this purpose shall admit candidate on basis of inter-se-merit. The merit is decided on the basis of the academic record of the candidate, the standing of the institutions from which the candidate can obtain the entry qualifications, etc. For complete details, please go through the brochure. For complete details regarding PMT admissions 2018 to Krishna Institute of Medical Sciences, visit kimsuniversity.in. Prospectus for KAIET Common Entrance Medical Exam 2018 can be purchased from the University Admission Office at the University from 9.00 a.m. to 5.00 p.m. Filled form has to be submitted to the University before the due date. If you are requesting the prospectus via post then you need to send a DD. The candidate should acquaint himself/herself with all requirements with regard to filling up the application on-line as well as submission of application for the PMT test. Purchase of the application form is Rs 500/- and at the time of submission you have to send in a DD of Rs 1000/- (total cost Rs. 1500/-). 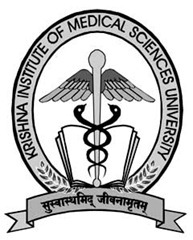 All DDs should be drawn in favor of “Krishna Institute of Medical Sciences University” payable at Karad. Students can check their application status on the website by filling out their application number and using their date of birth as password. Those who submit the application in person may pay the fee either by a DD or in cash. For admission in MBBS and BDS, candidates are advised to obtain and maintain proof of demand draft and dispatch of the application form. The application number will be your login ID for the University website. The application must reach the University on or before the last date mentioned. The University shall not be responsible for any delay or loss of the application / admit card / or any other communication in transit. The admit card will indicate the seat number, the examination centre (with its address) allotted to the candidate. The candidate shall not mutilate the admit card or change any entry made therein after it has been authenticated by the University authorities. Contact the University Office for duplicate Admit Card, in case the Admit Card is not received a week before the Test. Obtain duplicate Admit Card from the centre in charge, on the previous day of commencement of Test, in case of loss or non receipt of Admit Card. Note that issue of Admit Card is just a provision for appearing in all India examination 2018 and does not imply that the candidate is eligible for admission in MBBS or BDS. The syllabus for the combined entrance test for Physics, Chemistry, Botany and Zoology will be based on syllabus followed by 10+2 Boards/Universities. Please refer to the brochure for the complete KAIET 2018 syllabus. The KAIET Entrance Exam 2018 will be for three hours i.e. 180 minutes. It will be conducted in English and shall carry 200 multiple choice questions from Physics, Chemistry and Biology. Select the answer only if you are sure of the answer and darken circle accordingly. Only black ball point pens are allowed to be used while answering the OMR booklet. Duplicate answers are not counted so darken circle only when sure of an answer. Candidates are not allowed to use whiteners or any other correction fluid. Candidates are advised to go through the Mock Test for various entrance exams for medical admissions. Krishna Institute of Medical Sciences MBBS & BDS Test 2018 is a highly popular medical programme. The key to appear for this paper is to relax and study each concept carefully and thoroughly. You can opt for MBBS online coaching to be more thoroughly prepared. Join coaching institute such as askiitians  that will guide you on the correct way to study for all India medical entrance exam 2018. They have the experience and the knowledge to mentor you on important topics, exam preparation methods and books that you should refer to while preparing. Apart from the books mentioned above, study packages, guides and CDs for Medical Entrance Exams by established publishers should also be considered while preparing for a medical admission 2015. Visit sites such as flipkart, amazon and infibeam for deals on medical books that you can purchase. You can also search the net for free download of medical books. Become Exam Proficient: Become an expert on everything related to your KAIET 2018 syllabus along with the pattern and probability of questions. Make sure to go through previous year question papers. Apart from your school teachers and medical online coaching will guide you on the important questions or topics that you should prepare thoroughly for your PMT exam. Know Thyself: Knowing your own strengths and weakness is one of the most important aspects to be successful. Appear for mock exams to know your preparation status. Enhance your strengths and improve upon your weaker spots to be the best at your medical entrance exam syllabus. Set A Time Table: A daily and weekly time table gives you clear cut goals. Be sure to allot time to each subject. Create small term and long term goals for medical exam syllabus 2018. Each topic can be subdivided to make it easier to understand and remember, Practice and revise continuously. Turn to Experts (Teachers & Counselors) and Friends for Assistance: When in doubt call, mail or simply walk into the offices of people you consider expert in the field of your study. Ask them for help, and they will surely guide you on how to ace your BDS & MBBS 2015 entrance exams. Learn to Relax & Be Positive: You are bound to feel nervous while preparing for or appearing for KAIET 2018 exam. One of the most important tricks is to learn to relax and keep a positive attitude. Take a deep breath whenever you feel overwhelmed, nervous or jittery. Krishna Institute of Medical Sciences previous years papers are also made available at askIITians, absolutely free. It is imperative that you practice all India PMT previous year question papers repeatedly to build up both speed and precision. Revision of all topics along with your paper solving abilities will definitely impact your chances of selection. Check your answers after you finish an exam. Don’t be lenient in your marking. Your entrance test ranking determines your counseling session. Once the Krishna All India Entrance Test for 2018 has been conducted, a detailed answer key will be provided. This will give you a chance to calculate your own eligibility while you await the final result. Please note that you may not be 100% sure of the answers that you have submitted while appearing for the PMT test. Krishna Institute of Medical Sciences MBBS and BDS all India combined entrance result will be based on merit. Results will be published in the month of June 2018. Merit list of candidates will be displayed on the University notice board and published on the website. Students can get their marks verified by the university by filing out a form. The last date for submission of Application for Verification of Marks is June 2018. The final merit list will be prepared by June 2018. Once the results have been declared, students will once again have to visit the University website to learn about MBBS counseling date 2015. Candidates should ensure that they fulfill the eligibility requirements as stated in the prospectus before reporting for MBBS counseling. The appearance at KAIET 2018 and inclusion of name in the merit list do not necessarily mean that candidate shall get admission to the course. Admission to the course shall depend upon the availability of seat at the time of turn for BDS & MBBS admission. Admissions made at the MBBS admission sessions 2018 are provisional, subject to verification of eligibility by the University.